I am a big fan of allowing students the ability to choose how they want to show me evidence of their learning. Yes, most students prefer to do this in written form because that is what they are used to. However, every once in a while a student will produce something that really blows me away. While studying Ancient Greece we were discussing various forms of government. One of these was an oligarchy which is simply a form of government in which the decisions are made by a small group. My students typically giggle at the sound of oligarchy because they think it is something the can order off the menu at Olive Garden. 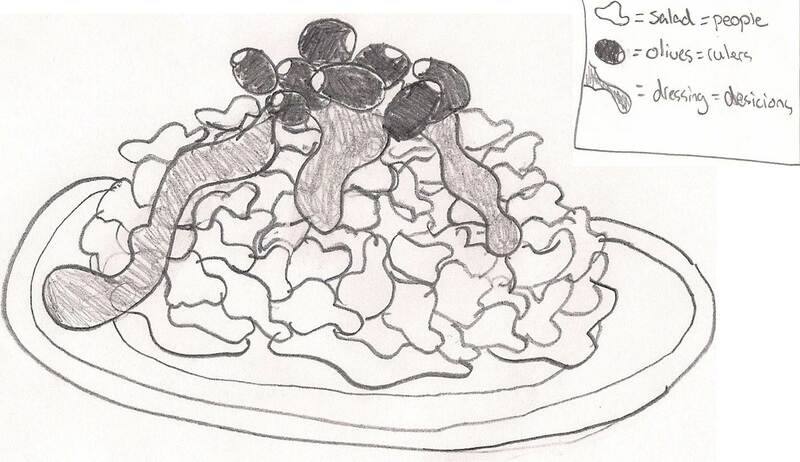 During one of the activities students wanted to draw pictures of what they thought oligarchy would look like if it was a dish on the menu. Here is one of these pictures. It is clear to me that this student understands the concept of an oligarchy through this picture. She clearly illustrated the small group of decision makers as the olives on the top of the dish. Then there is the “sauce” that represents the decisions that impact the rest of the population which she used noodles for. I don’t need her to take a test or write me an essay. The abstract manner in which she illustrated her understanding is more than adequate. As I plan my lessons and subsequent assessments, I try to constantly be looking for opportunities for students to show me their comprehension in a variety of ways. How often do we allow students the choice to show us their learning in a different way? Must all learning be shown in the same manner? I agree. I'm also less worried about HOW a student demonstrates knowledge and understanding. I'm also flexible regarding WHEN the student demonstrates that they have grasped the material. If one student doesn't 'get it' until 3 months after the lesson their grade shouldn't be any less than the student who immediately understood the material. Sometimes its much easier for weak teachers to hide behind rigid guidelines than it is off them to show flexibility in their teaching. I gave my students choice for the last unit and was very disappointed by over half the class submitted some sort of test that they designed. However the ones that thought outside the box really impressed me. I was given artwork, a scrapbook, and baked goods all demonstrating a different interpretation of the material. When I talked with one student who simply made a PowerPoint he said he felt frustrated with himself over only doing a PowerPoint. When faced with a choice, he chose the medium with which he was the most comfortable. The problem is when I am the only teacher giving choice, my students really don't know how to deal with that and stick to what they have been trained to do. I love giving students choices in how they present their information. Major projects have at least 10 choices (from making a poster to creating a website) and every day activities usually involve "however you want to explain it." I had to ease them into it though. The first of the year I would give a few examples and then less and less, though I remind them of the examples they have done in the past. Today I gave my reading class 3 choices for an assignment and told them "I don't care how you do it," most of the kids in my reading class are not my everyday science students, it has blown their mind. And I have had 3 ask me "Can I just write a few paragraphs?" No. I think it is just as hard for students as it is teachers to break the traditional "school" mode. Like Marc's comment, it becomes hard for them to not do what they are comfortable with. That is where every day instruction comes in, may be have a day to teach how to make a comic online and give that as the only option or how to draw a huge mind map on butcher paper. That way you have exposed them to different methods when it comes time for that choice. So glad there are open minded teachers out there that let students choose. Seems simple enough. Thanks for the comments...yes, I think some kids are trained and do what they find comfortable when given the choice. I am not a teacher that will force a kid out of their comfort zone, but I will STRONGLY encourage kids to try something new. There are lots of perspectives on if you should have students work on their weaknesses or hone their strengths. I prefer to do both. I like to allow kids to be comfortable doing what they know while pushing them to dabble in new ideas. Bottom line, when kids feel they have a choice and can have input in their learning it has very positive effects. I love the picture! It demonstrates deeper understanding than a memorized definition on a test. I've been thinking a lot about this as well and blogged about it here. The more I think about it, the more I wonder if there are any circumstances in which all assignments should look the same. Diversity doesn't looks as neat and tidy on a bulletin board in the hall, but demonstrating conformity is not the goal. Giving students freedom to demonstrate material in any way they choose takes the emphasis off of appearance and places it on understanding. Like you, I try not to force them out of their comfort zones but I do find that demonstrating a new web tool or program usually encourages a few students to try it out.